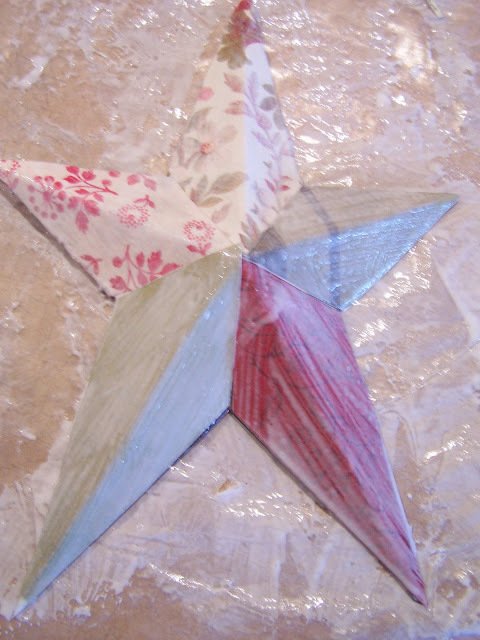 Just a Girl is having a "I Can Make That" party and never wanting to be one that is left out, I decided to join in with some papered barn stars. This is not my original idea--it's one of those I tucked in my brain, maybe saw it in a magazine?? But, I haven't seen a tutorial on it so I thought I'd share. I probably am showing you way too much of the process, but here goes. 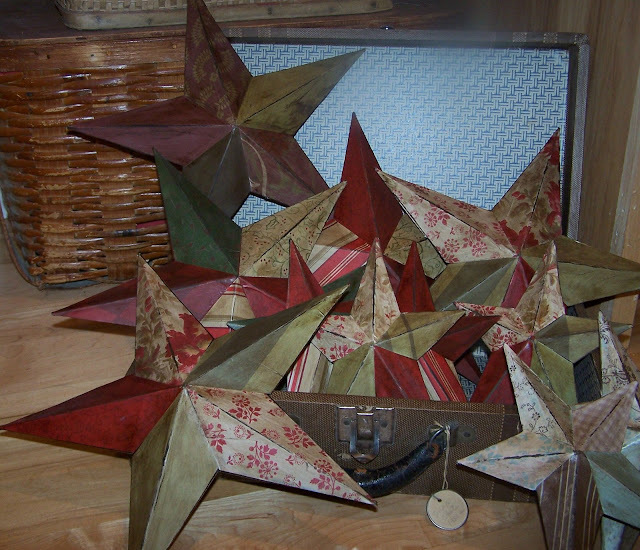 I started with a bunch of metal barn stars. I bought these at a place called Real Deals. The larger ones were $2.60 and the smaller were just under $2. I sorted through my stacks of scrapbook paper to find what I wanted. 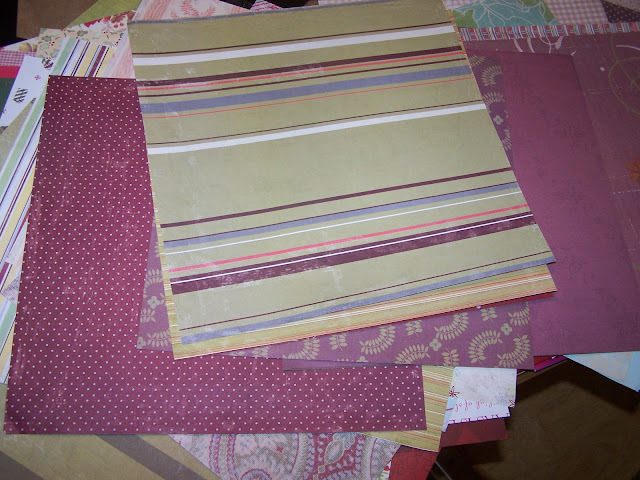 If you are color/design challenged, scrapbook paper mats (pads) make it easy as they have coordinating paper all together. 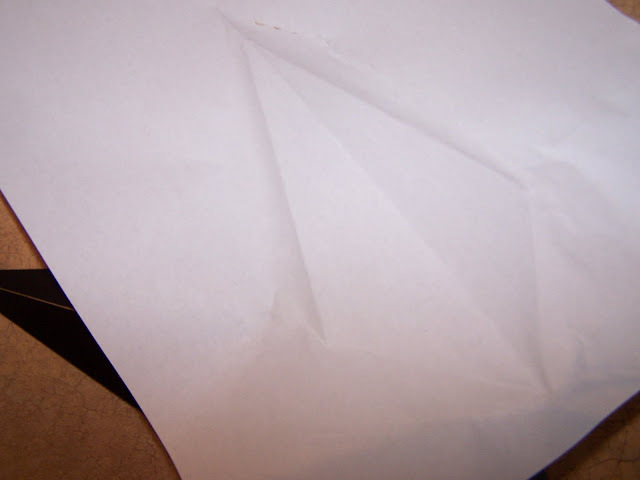 I then used a sheet of white computer paper and pressed it on the star to make a pattern. The larger stars all had the same sized points, the smaller one all had different sized points or arms or whatever those are called. Ignore the chocolate smudges on my pattern, I was making (and eating) chocolate chip cookies at the time. 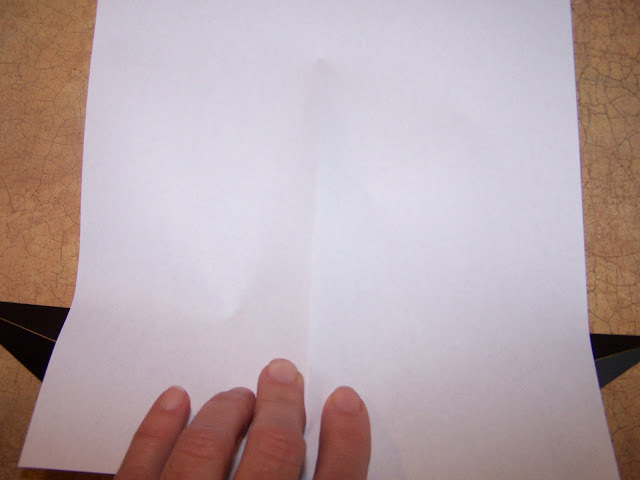 Next, use your pattern to cut out your paper. 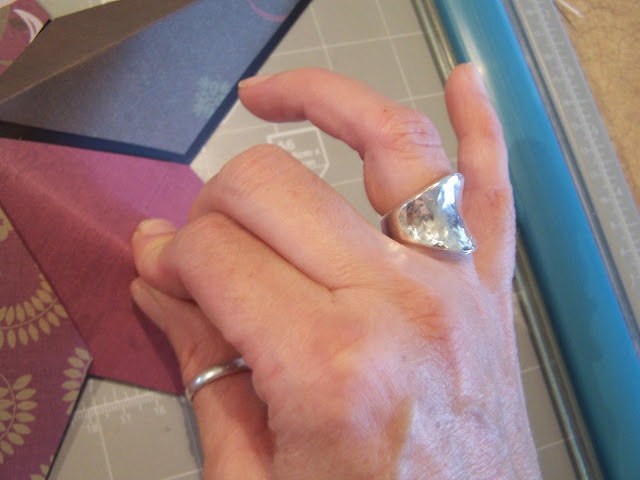 Press the paper on the star to get the fold on it and to check to see if it fits (not sure why my pinky is up--must have thought I was having tea). I used modge podge (watered down a little because I wasn't sure I had enough). 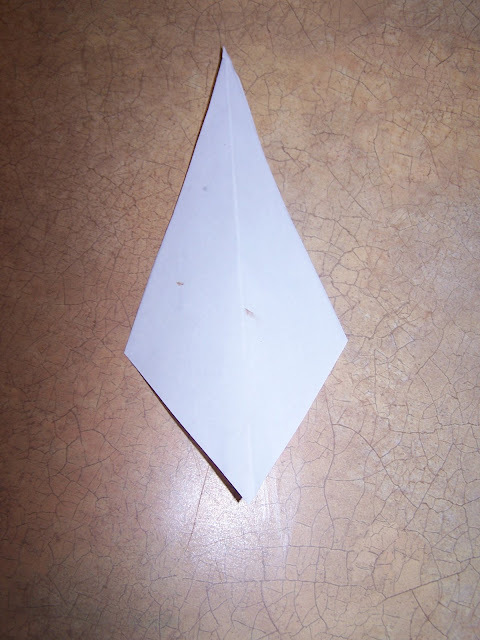 I always put the modge podge on the item and on the paper. I think Martha told me that helps prevent bubbles. Then cover it all in decoupage glue. When it was good and dry I sanded the edges with fine grit (220) sand paper. I then stained it with walnut stain. See the difference the stain makes? 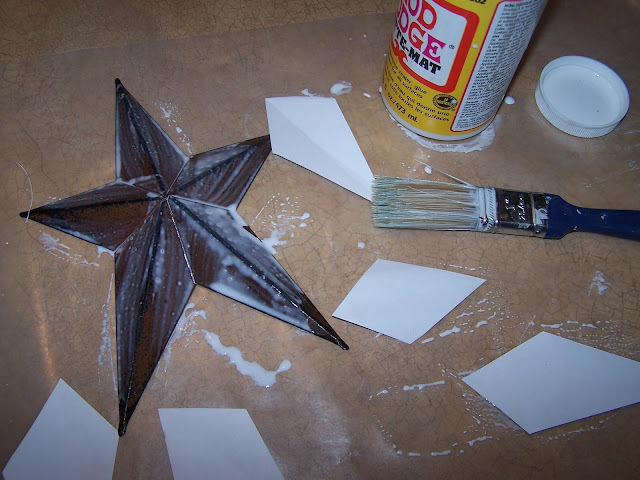 When the stain is dry, spray a clear finish on the stars. And there you have it. The little ones still need a ribbon through them. The larger ones have a hanger on the back. 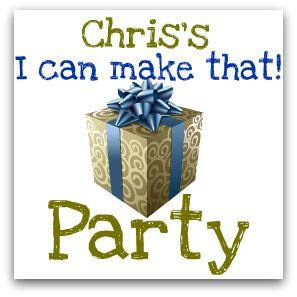 Check out Chris's blog--I have found lots of great ideas and blogs from her party. What a great idea! I have been looking for those metal stars for years, unfortunately we dont sell them here in Australia,well I stopped looking about 5 years ago!I'll have to be on the hunt again! The little metal thingy on my blog you were inquiring about...I was hoping you would tell me!! I just love this idea and have thought of doing this myself before, but now seeing it done, I'm going right now to dig out some papers. I have a metal star hangin' in this room. It will be a great gift. Thanks so much for sharing it. Looooove this idea! They might be the perfect thing for me to do! :) What stain do you use & where do you find it? I have seen these stars, but I wasn't quite sure how to approach doing it! Your tutorial was awesome! 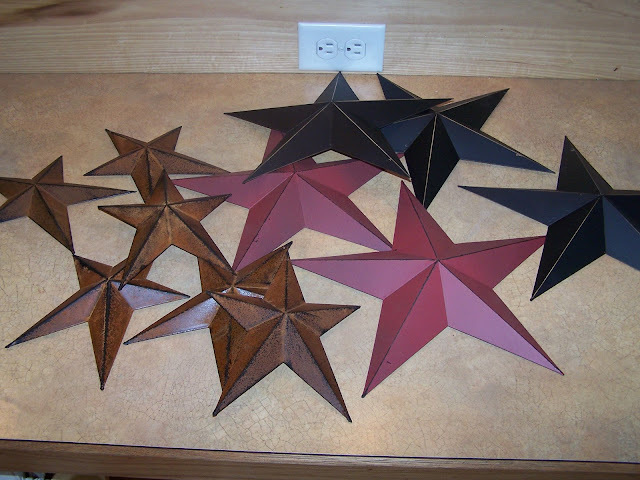 Thank you for sharing this project, but I sure do wish I could find the stars for that cheaqp! You're so lucky! 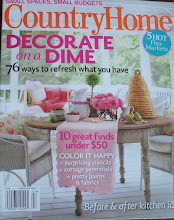 I found your blog by way of Just a Girl's "I Can Make That!" post. You are sooooooo creative! I think you could give Ki and Sue a run for their money! Great blog and great ideas! These are beautiful! A bunch like that would be great for a tree. Thanks for sharing! Thanks for the great ideas!! Christmas funds are down this year...and this gives another idea of things to make as gifts... Love your blog and check it often. 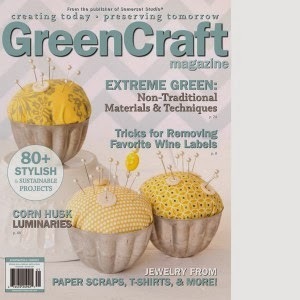 I am just thrilled that I have found your blog because your projects are just AWESOME! I have been looking at your old posts and found so many things I want to copy. I love to find a new blog that inspires me and you do!!! WOW great idea! Great deal too! Thanks for sharing. Hey you beat me to that project! LOL! I was planning on doing that two a couple of stars I have. Yours came out so good!! Love them! Ohhh I love what you have done with thoes stars. And I love what you did with the door panels and hooks and pictures! Awesome! My boys' room is begging for some wicked cute altered barn stars...add it to my never ending to do list! I have to admit that I am freaking out at how CHEAP you were able to find the stars for!!! Wishing I had a Real Deals right next door I could raid. Oh my goodnes...thanks for sharing this idea. I love the brown and robins egg blue design. I seriously need that for my home. Ha ha! Great blog. Keep up the awesome work. Wow! Those are so cute. I love these stars, but would NEVER have thought of doing something like this. How great!! Thanks so much for sharing. I love this! I saw your work on Michelle's blog - well, what she made from your instructions. VERY cool idea! 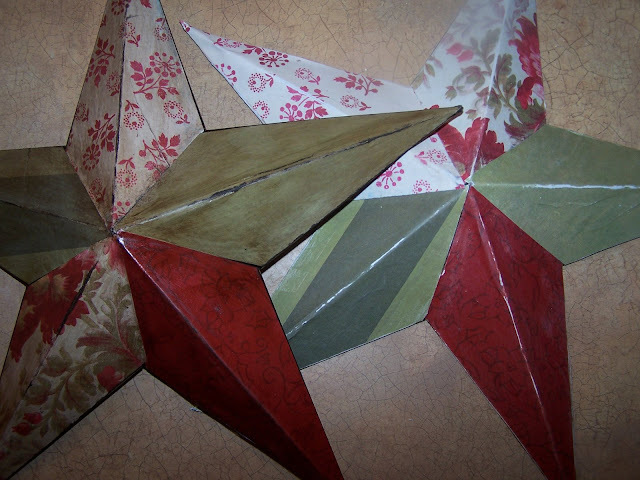 I just found your blog and I am in love with your stars! So Cute! Hi! I was just cruising the blogs and came across the Junk revolution site! 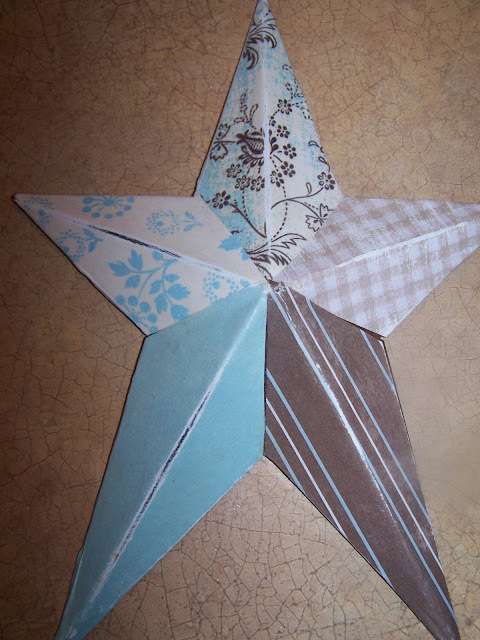 I just love your paper star idea. 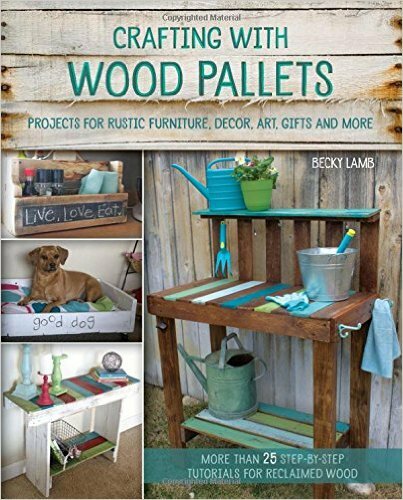 I am now on the hunt for additional things to Mod Podge and stain!